HEC Montréal and the Sainte-Justine hospital signed a memorandum of agreement yesterday to create the Sainte-Justine school of context-based health management (EGSC), at a ceremony attended by many guests from the healthcare community. “This association between HEC Montréal and Sainte-Justine will allow the School to offer courses and training perfectly suited to the realities of medical practitioners,” agreed Alain Rondeau , Management Professor, and Sylvain Landry , Professor of Logistics and Operations Management. “The value added by the Sainte-Justine EGSC lies in the way it will assist multidisciplinary teams of doctors, professionals and managers, in the field, in dealing with very specific issues,” added Dr. Fabrice Brunet, Executive Director of Sainte-Justine. The mission of the Sainte-Justine EGSC is to hone participants’ skills and develop training and coaching content that will be both on the cutting edge of management research and highly applicable within the healthcare system. 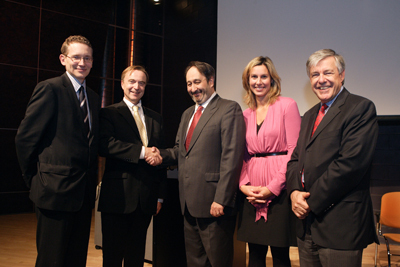 From left to right : Sylvain Landry, Professor, Logistics and Operations Management and Associate Director, Health Group, HEC Montréal, Dr Fabrice Brunet, General Manager and Secretary of the Board, Sainte-Justine Hospital, Michel Patry, Director, HEC Montréal, Isabelle Demers, Assistant to the General Manager, Sainte-Justine Hospital, and Alain Rondeau, Professor, Management, HEC Montréal.